It's been a while, but I finally have a few things to write about! 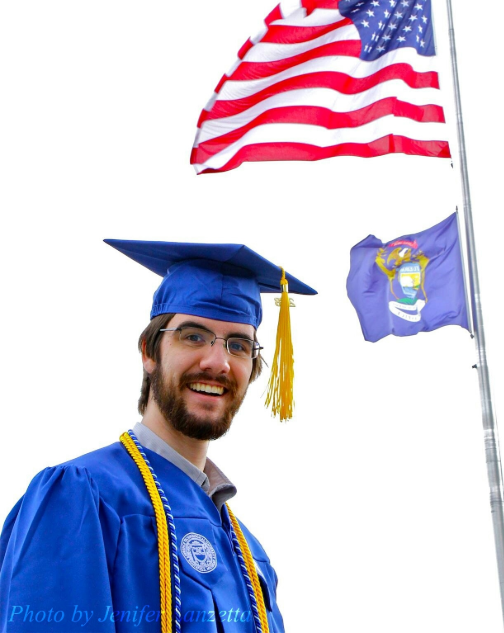 After four years of studying computer science at LTU, I officially graduated university! On Cinco de Mayo! And now that I'm done with school, I return to working a fulltime job at Dreaming Door tomorrow (Monday)! If you do the math there, I had an entire 30 days of free time between graduating and starting work. Amazingly, I used every single day of my time off to get as much as I could done on my projects. And that's the topic to today's blog post! Zanzlanz.com has had the same design since 2014, so it's getting a bit old! Plus, it isn't designed for small mobile devices. I decided to start working on another redesign of the site to make it more modern, work on mobile phones, and be able to support my future plans. The white page border was removed in favor of a dark theme! On a smaller screen, the page resizes. Mobile friendly! Top of the site is compressed, and the second row of buttons was removed. Buttons, links, images, boxes, and icons have effects when you hover over them. The YouTube section list some of the recent videos next to the player. The Twitter feed is now in three columns alongside my follow suggestions. The Zanzwuts section has 16 links now, instead of just 6. The footer now contains links to my social media and my other websites. Here you can see how the site looks in the smaller (mobile) view. Nearly all the information is still there, just more compact. The entire website will do this! 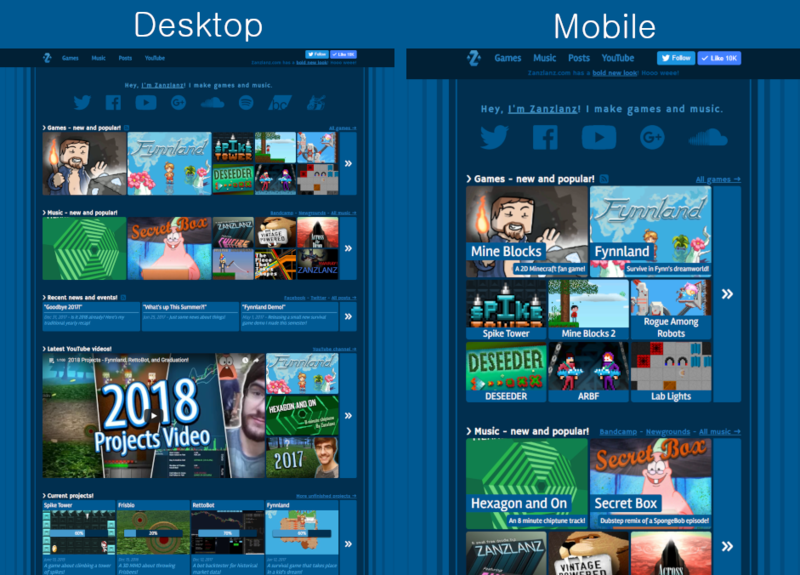 I also finished redesigning the about page and games page. Both include additional improvements. Below you can see a comparison between the current games page and the new one. It's visually more dynamic, mobile friendly, and a bit better compressed. Overall, the site redesign is going very well! I have another 20 pages to switch over before it goes live. You can track the progress here on the homepage. In order for my games to work after the year 2020, I have to re-code them in a different programming language. I decided to port them to Haxe and Lime, by creating my own OpenGL ES game engine. I started this process about a year ago! I barely had experience writing OpenGL code before now, apart from some stuff from school and my ShaderToy shaders. Only a few things are left before I can start porting my games to my new engine! I'd like to start the move to my engine by porting Human Apocalypse, and work my way forward until it's good enough to port something like Mine Blocks. It's such a slow process, but hopefully I can be efficient! I've been working on a professional web app called RettoBot since the start of the new year. 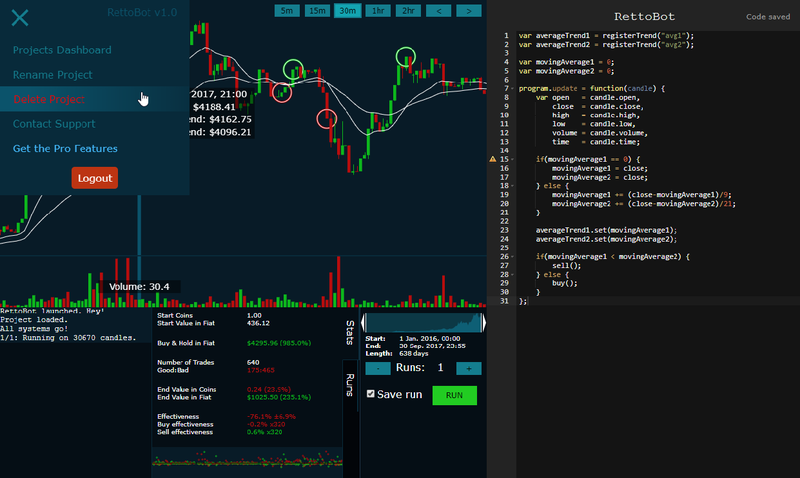 It's a site that makes it easy for programmers to write trading bots and test them on real historical data. This is for things like stocks and Bitcoin. Over the past month I made a lot of progress with project management and the main interface. RettoBot is nearly functional enough for me to do a closed pre-release testing with some friends. I'll get some good feedback, polish the site, finish it off, and try for a real release. I'm really excited to see how it goes! The last non-game software I actually released was probably a drawing app when I was like 12 years old haha! Mine Blocks 1.29 has been making good progress too! Zombie AI was separated from rendering! Slimes and Magma Cubes are done!! The code for mobs is 70% smaller now! Right now I'm working on some big features. It's been a while since the last update, so I can't wait to get to that point! The changelog is at 59 changes/additions, and there are around 32 more to do before the update is finished. It feels really nice to be making so much progress, and I think I'm getting a lot closer to finally finishing some of these big projects. Things will slow down a bit now that I'm starting work, but the big push this month helped build excellent momentum, and I think I'll be able to release some cool stuff soon™! Dec 31, 2018 - A post about the many things I did in 2018! "Goodbye 2017!" Dec 31, 2017 - Is it 2018 already? Here's my traditional yearly recap! "What's up This Summer?!" Jun 25, 2017 - Just some news about things! Hm it looks like names on comments don't work with whatever symbols you used. I should look into fixing that in the redesign! Thanks btw! It is great to read that he has graduated from college! I remember well when I asked him how much time he needed to graduate! I hope you have satisfactory progress in your projects and do everything you have wanted to do now that you have plenty of free time! Hugs! :3 ~CriX Unlimited ;) PS: Yep, I changed my name! Thanks a bunch Cristian/CriX! Today I started a fulltime job haha, so I'll certainly won't have as much time as in May xD but I'll try my best to keep making good progress. Congratulations on graduating! :) And well done for working on the new game engine, it will definitely come in useful! Hey Topaz! Thanks! I'm hoping the engine helps a lot :D it's fun to make something like this!